Providers serving older adults face a growing problem. Older adults are becoming increasingly dissatisfied with service quality citing deficits in provider communication and relationship skills. The author argues this dissatisfaction is largely related to three widespread issues: ageism, use of professional jargon, and age-related changes in the older adult. To address these concerns, Dr. Storlie advocates adoption of an evidence-based, person-centered approach to communication. The benefits of person-centered communication are many. They can increase older adult satisfaction with provider services, enhance mutual respect and understanding, improve accuracy of information exchanged, positively impact service outcomes, increase compliance with provider recommendations, and reduce the frustration and stress often experienced by both provider and older adult. Rare to this genre, readers are introduced to several under-explored topics within the field of communication, along with methods for applying concepts from research findings into these topics to enhance the quality of interpersonal communication. Topics include the role of mental imagery in the communication process, the influence of neurocardiology on relationships, and controversial findings from research into quantum physics. The book concludes by highlighting progress made in narrowing the interpersonal communication gap and forecasts how communications-oriented technological advances might improve quality of life for 21st century older adults and the providers who serve them. 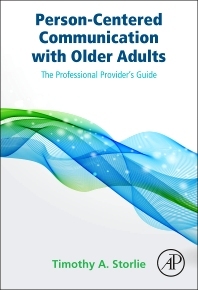 Utilizing interdisciplinary case studies to illustrate common problematic situations, this book provides detailed exercises that explain how providers can integrate person-centered communication into their practices to improve provider-older adult interactions. Written in a style designed to maximize learning, it helps providers find the information they need, understand what they read, and apply what they’ve learned to improve professional communication. Person-Centered Communication with Older Adults is an essential guide for today’s healthcare professionals and other aging-services providers, and also for the educators who help to prepare the providers of tomorrow. Aging services healthcare providers including psychologists, physicians, social workers, nurses, rehab and occupational therapists, etc, as well as instructors and students in similar fields. Person Centered or Provider Centered?